The workshop of Ettore de Cesare is in Vomero, a residential neighbourhood on the hill behind central Naples. But he lives in the centre of town. Every day he reverse-commutes, driving up the hill while on the opposite side of the road a long snarl of traffic tries to drives down. This is not the reason he lives in the centre, of course. He lives there because it’s more fun, and interesting, and because it’s no longer as dirty or dangerous as it used to be. I found his arrangement interesting because another tailor in Altamura - Sartoria Cornacchia - said the same thing to me the other day. Their workshop is in a set of flats outside the city - where their parents moved to - but they now live in the centre. It is a generational thing, more than anything else. 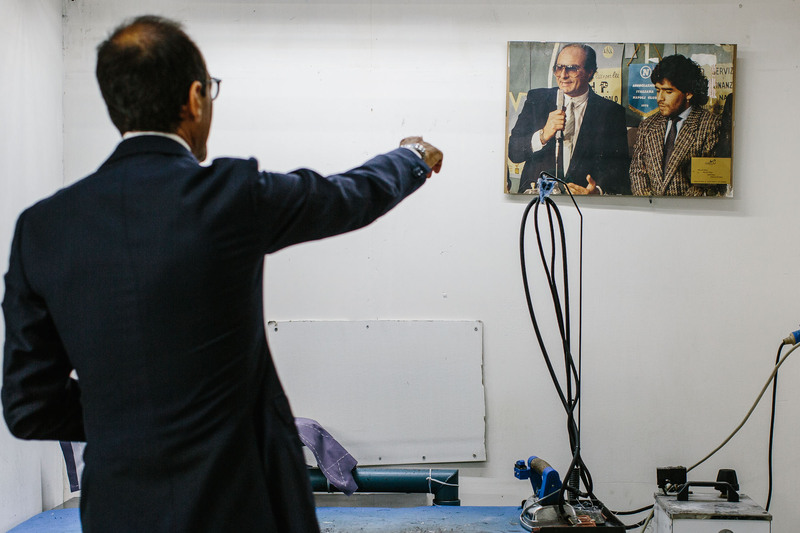 Ettore’s grandfather lived in Vomero, and set up the workshop there in 1960. Ettore has since expanded and modernised it. The work is done in four interconnected rooms under arches that were once used as bomb shelters (above). The showroom is in the building next door, though a gate in the fence. The showroom is a little too modern for me, but the arches have a lovely atmosphere, with each effectively dedicated to a different stage in the making process. Particularly noteworthy was the photograph on one wall of Ettore’s father with Diego Maradonna, wearing a De Cesare jacket (above). It caught our eye because the previous evening Maradonna had been in Naples, to receive the freedom of the city in recognition of his time playing for Napoli. He was staying in the Grand Hotel Vesuvio, next to us, and all night a crowd of fans waited outside, chanting his name and hoping for an appearance on the balcony. It finally happened about 1am, just as I was falling asleep. Ettore’s master tailor, Luigi, works in the first arch of the workshop and oversees much of what is done elsewhere. We watched as he laboriously but four rows of stitches in a hand-padded collar (above), slowly rounding its shape as he went. The stitches were also small and more numerous than many Neapolitan makers. In a larger room down a couple of stairs, Luigi was overseeing a young apprentice, Alessio (above), who was repeatedly padding the chest of jacket after jacket, trying to get his speed up. 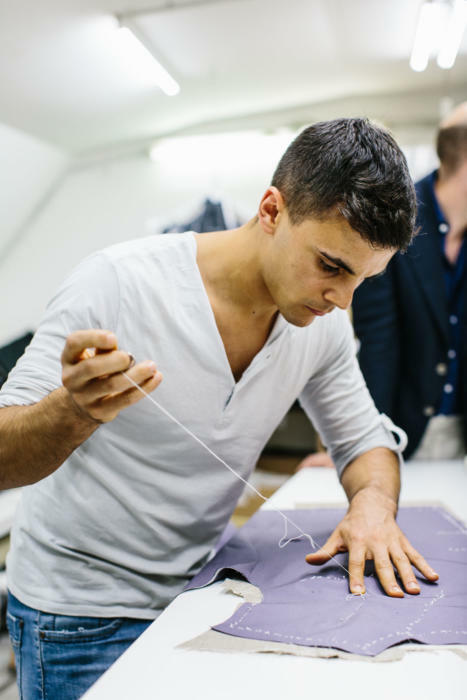 It’s relatively rare in Italy to see young people learning tailoring - certainly compared to the UK or Japan - so it was great to see Alessio’s focus and dedication. 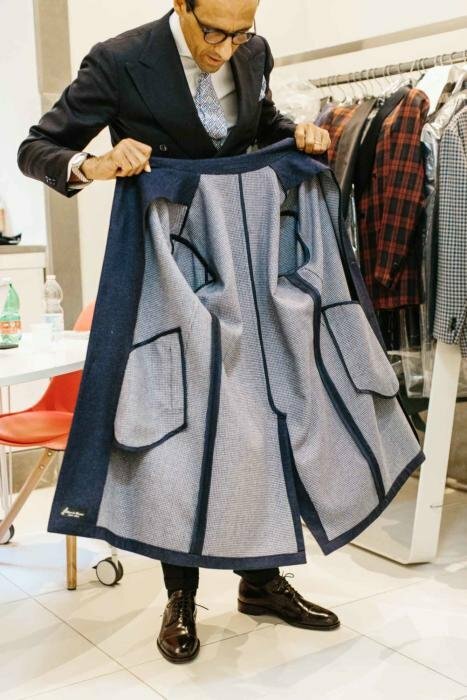 Luigi also demonstrated the process of inserting a sleeve into a jacket (above). This is one of the hardest parts of assembling a jacket, as the sleevehead is 5-7cm bigger in circumference than the armhole it has to go into. The excess must be worked in gradually, all the way round the armhole, with a smooth finish where it is desired, and ripples where it is not. The ripples at the top of a sleeve on some Neapolitan jackets - often associated with ‘spalla camicia’ or shirt-shoulder construction - are a good example of the latter. Ettore’s team are also good at working with unusual designs or materials. I noted in my review of the jacket and coat he made me that this includes suede and leather - as I had under the collar of my pieces. 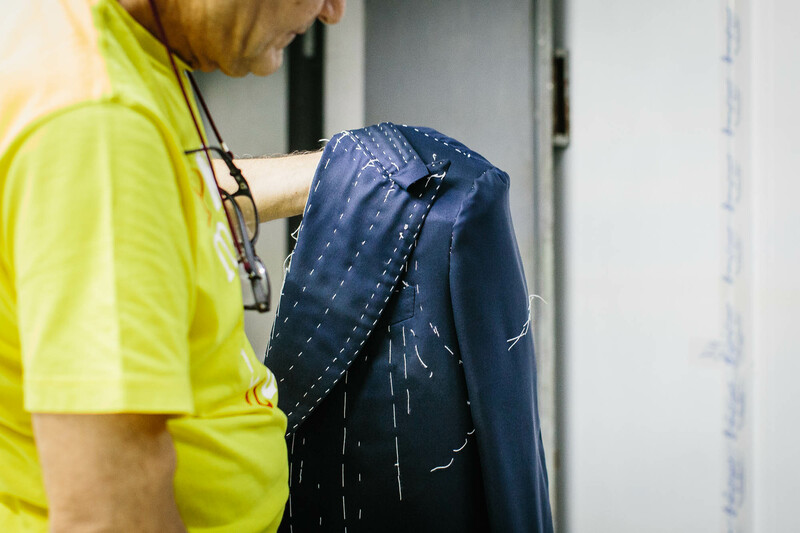 When we visited the workshop, the team was working on a design sent by a customer, of an Indian Nehru-collared jacket in light-blue wool with blue-silk details. Not my cup of tea, but interesting to see the range of work. 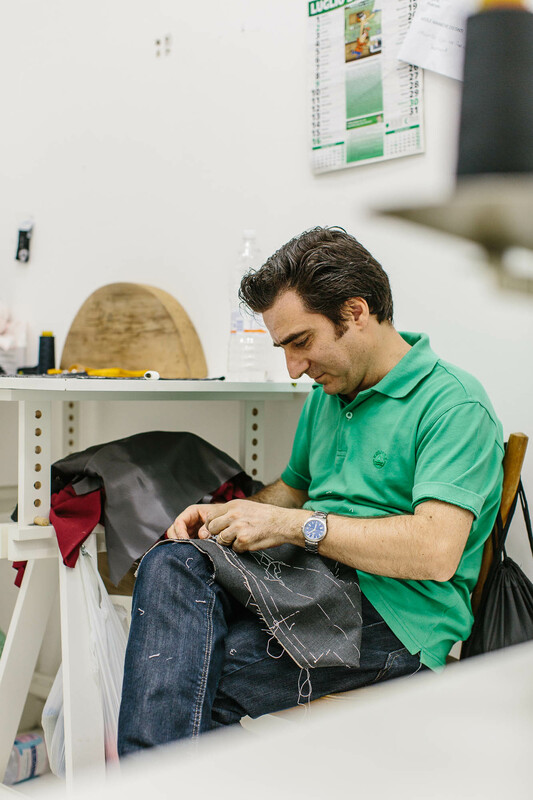 Back in the showroom, Ettore walked us through a few of the styles he has been working on. I always welcome attempts by tailors to innovate, even if some of them are not to my taste, or plain don’t work. 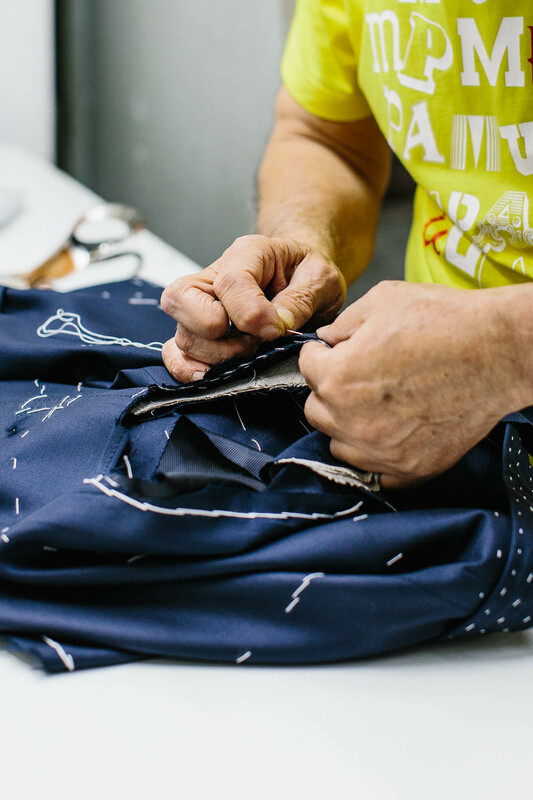 As long as they maintain their quality and focus on craftsmanship, it’s a useful way to stop tailoring from stagnating. 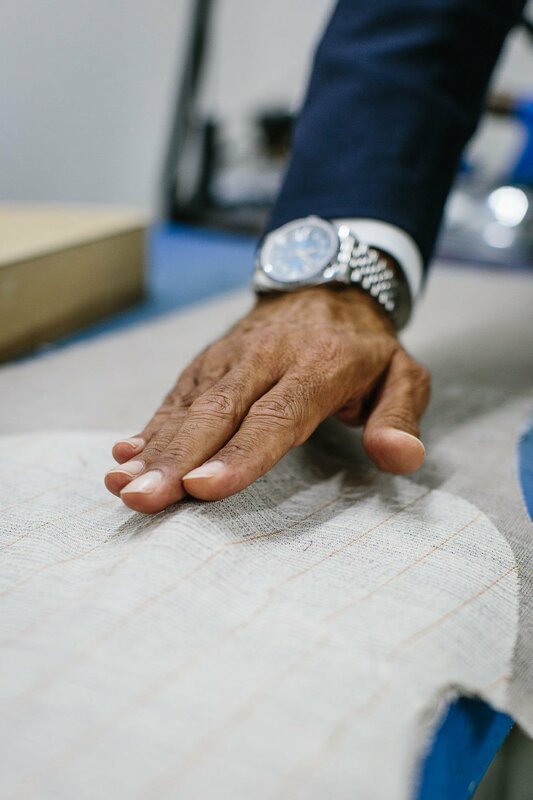 I tend to prefer bespoke pieces that have a full canvas, as they benefit from the hand-padded shape in the chest and lapel that you won’t get with ready-to-wear. 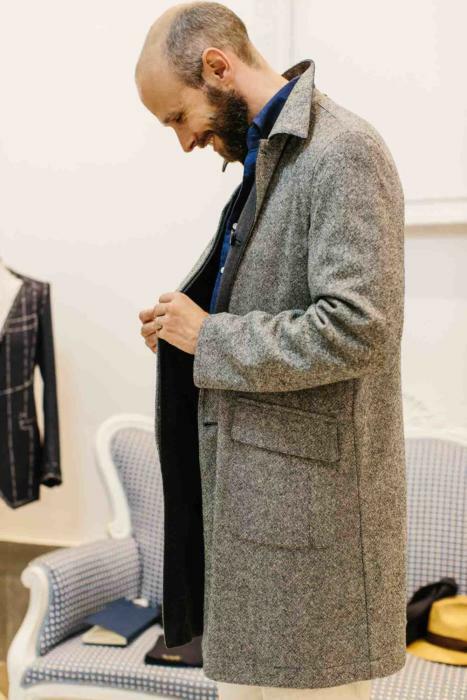 But these pieces do appeal to guys that want to create their own unique versions of such coats, and with a better fit (the other two benefits of bespoke, aside from the make). It was lovely seeing Ettore's workshop, particularly as our previous meetings at Holland & Sherry in London had been so fleeting. We also had more time to talk later, as we had dinner round the coast in Marechiaro (Al Faretto restaurant). Given the quality of Ettore's work, and the frequency of his visits to London, I'm sure we'll be working on something else again soon. You can follow the discussion on Ettore de Cesare workshop, Naples by entering your email address in the box below. You will then receive an email every time a new comment is added. These will also contain a link to a page where you can stop the alerts, and remove all of your related data from the site. In Britain it is very much the preserve of the elite or PS readers who pursue tailoring. Is this the case in Italy or do most still waltz to the local tailor? On a slight tangent , although there are few tailors in Britain there is the proliferation of online (and some ‘offline’ rental office space based ) MTM ‘tailoring’ that often masquerades as bespoke . Your assessment of this is much needed as these people are charging / profiteering from the general ignorance around different types of bespoke , when MTM is no better then RTW etc etc . True, although really the decline was in the 70s-90s. The past 10 years has seen a re-birth of interest in bespoke, and that is something we can and should celebrate. Point taken on MTM/bespoke. There will actually be a few reviews of MTM places, starting with P Johnson next week. I think you should try the Swedish firm Saman Amel that is making high-end MTM with Italian tailors. They are opening in London this month. They had a trunk show in London this month, yes… Saw the guys last week, and having a jacket made. Won’t be fitted until October when they’re back, but there’ll be a review then. Both Saman and Dag is great guys. I hope that you will be satisfied with the jacket. Thanks, yeah they’re great, and lovely to see the things in person. 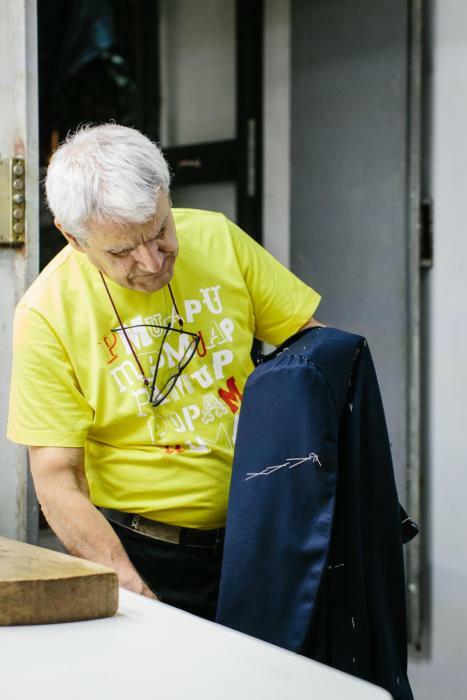 What makes you think tailoring is not the preserve of the elite in Italy? Don’t be fooled. 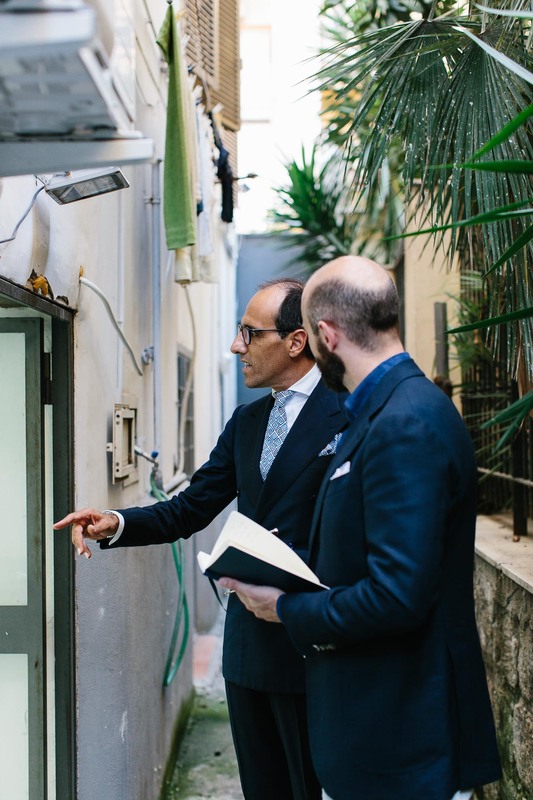 The average Italian doesn’t go around wearing bespoke suits. 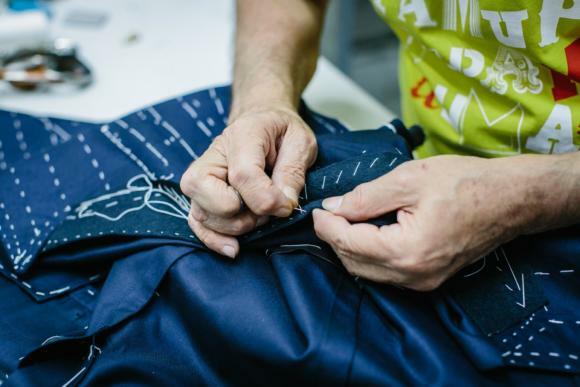 The working class in Italy cannot afford bespoke, just like their counterparts in the UK. 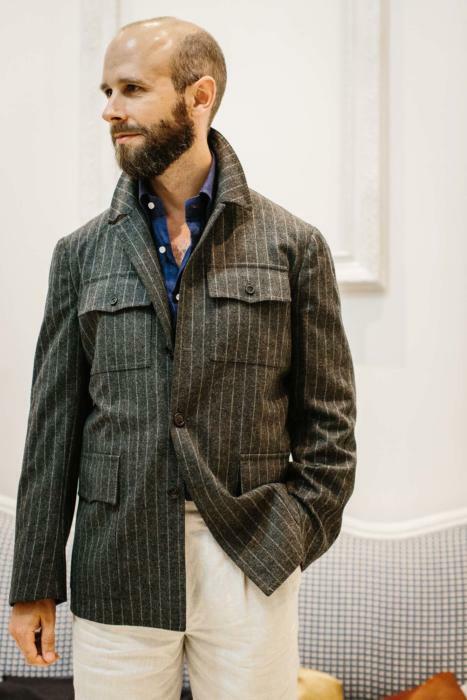 I like the look of the chalk stripe safari jacket. What did you think of it Simon? The cut is good and the jacket would look great in a nice linen, plain flannel or cord. It is nice to see the updating / revival of this type of style. It represents a real alternative to the traditional suit / blazer design. I would like to see PS focus on this Safari / Work Jacket/ Over Shirt look together with appropriate trousers, shirts and sweaters. The PS neck square is also a great accessory for this look. It really brings out my inner Jason King in me. More focus and a complete piece on this is required Simon! I like the experiment but on further reflection wonder if it would work better in tweed. Sort of an autumn field jacket. Simon, can you remember how structured that jacket is? And what cloth would you find appropriate? Could tweed really work for a Safari jacket? It’s not structured at all, nothing in there. A nice read, Simon. For a visitor to Naples, is it fairly easy to communicate with Ettore, Cornacchia , etc. or will a translator be required? It varies a lot. Ettore, for example, speaks good English. Cornacchia speaks none at all (though his daughters do). The Ciardis are learning. I was also wondering about languages. Is it reasonable to assume that all italian tailors doing trunk shows abroad will speak English? Totally different topic : have you written about Cad and the Dandy suits? I am baffled with their offer which sounds surreal vs prices but I could not retrieve anything through the search bar on PS. Thx. I liked the look of Ettore’s tailoring from your previous post. The safari jacket would be nice in a woollen cloth though I’m not sure such a relaxed jacket goes well in a formal looking cloth like a chalk stripe. The car coat however looks great – I would love something like that over knitwear , flannel in the colder months. The growth of interest in bespoke has in many respects been down to blogs such as yours, English Cut, Rake and the like. From that we have seen significant growth over the last decade particularly in the desire to wear handmade, well-fitting clothing which of course should be applauded. 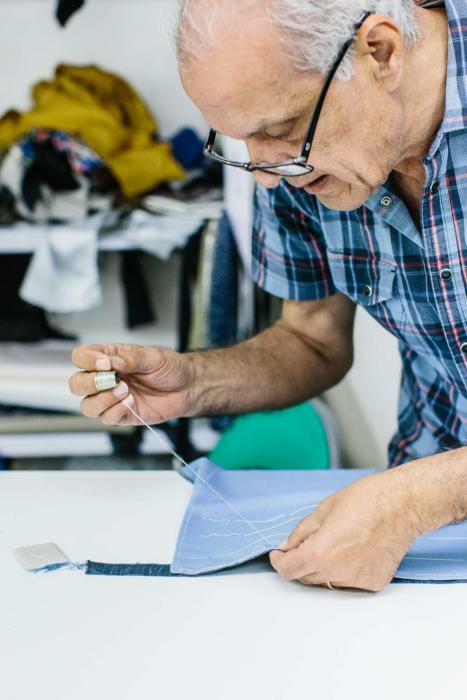 However this increased interest has led to a proliferation of companies offering some form of bespoke clothing which in many cases can’t be bespoke at the price point they offer. But, because people like you have stoked the fires of handmade clothing they proliferate and some thrive. Take for instance Cad and the Dandy. If you look online they seem to be a newish (formed 2008) company who have gone from strength to strength. According to Wikipedia they were a Courvoisier Future 500 company and have won other awards. Bloggers praise their hand-padded lapels, chest canvas and padding again all handmade and wide variety of cloth. So, on the surface at least they appear a good option and the price point they have chosen of £600 for a machine made suit up to £1,000 for a fully handmade suit are attractive. Yet you don’t recommend them and I value your opinion. Even Thomas Mahon is getting in on the lower(ish) price point for suits with some hand finishing. But are they any good? To be honest the only person I would trust to answer that sort of question would be you. Then we have local UK tailors. My first suit (circa 1973) was made by a local tailor and it was good. Companies like Burton’s used to offer tailor made suits (more like MTM I think) which were acceptable. Most have now gone. Living outside of London it remains very difficult to get quality clothing on a regular basis; trunk shows don’t seem to move outside of London and while London tailors are happy to fly to Bombay or Boston I don’t remember any coming to Barnsley or Belfast. Which of the local tailors left is any good? You have always said that you only report back on clothing that you have commissioned, which is admirable. It’s just that I would love you to commission something in Leeds, Manchester or Edinburgh rather than Naples or Paris. Ten years ago I was confused about why I liked certain suits better than others. Then I started reading English Cut – which alas seems to have dropped off the radar, blog wise – and your style blog. Now I think I understand more and certainly my recent purchases have been based very much on your principles; though I doubt I will ever get the satisfaction you do from continental styles and tailoring! However all this rambling comes back to the same points. 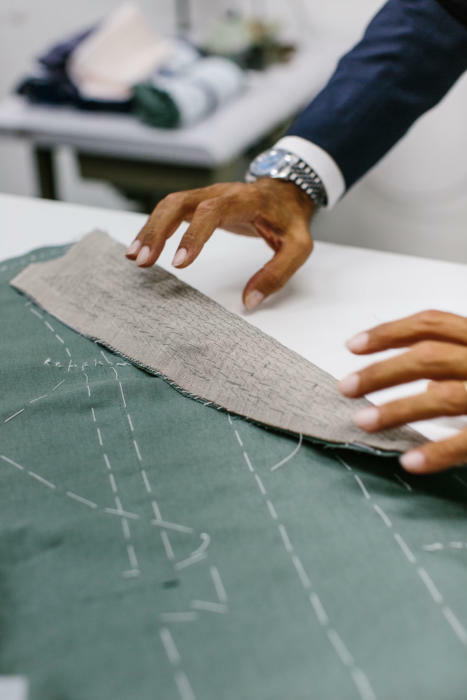 Please can you commission more pieces from tailors outside of London and can you please look at some of the second or third tier providers of “bespoke” and provide your usual thorough reviews of their pros and cons. I am about to order what will probably be my last bespoke suit so for me the race is all but run, but I would hate the next generation coming through who are inspired by you to go out, purchase a bespoke suit (from a lower tier supplier) and then be disappointed and go back to Hugo Boss or Marks and Spencer. Not that there is anything wrong with either of those companies but it isn’t bespoke. I do hope that you can do something to help Simon, the provinces are looking to you for expertise! Thanks John. I certainly will, though to be honest the brands at that level I find most interesting are the likes of Anglo-Italian, P Johnson, Eidos, Saman Amel. Good MTM, often with very high levels of handwork. The bespoke I’ve seen from regional tailors is rarely that good, and particularly lacks style. I will try to cover them, but I do think London is going to continue to be the focus. John, I would point you to London Lounge, where you will find contributions from highly experienced posters on a wide variety of related topics, not only bespoke. Simon your field of vision is very narrow. Look at Souster, de Boise or Merrion and you will find Row quality at better value. My comment on narrow related to yours about regional tailors not being of good quality. Goodness that’s a name from the past. Geoff made me a few suits in the 80’s and frankly I’ve not seen anything better since then, either the Row or Paris. I used to wear it …. 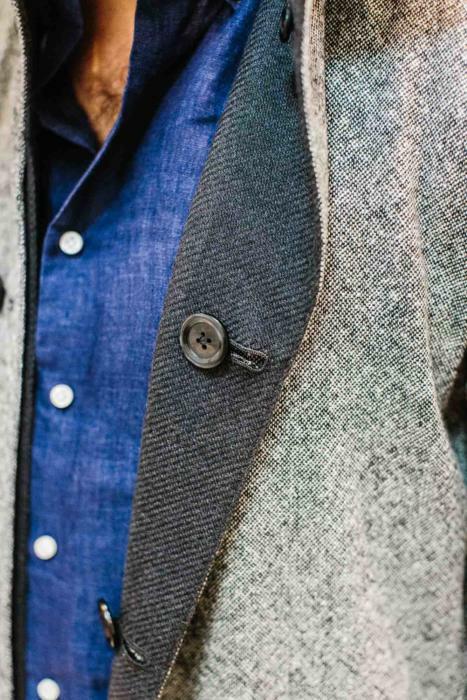 The cut is looking good & the jacket would seems great in a nice linen, plain flannel or cord. It represents a real alternative to the traditional suit design.